Huntington’s four Henry theater curtains were restored in summer of 2005 as a joint effort of the Historical & Community Trust and the Town Hall Committee. Later that year, the curtains were moved from the Town Hall to the new library in the Union Meeting House for safe storage and display. Two of the curtains—the city scene and a lake view from what appears to be the balcony of a European villa—were installed on the rear walls of the library. Our largest and “best” curtain, known as the Grand Drape, was wrapped for storage because it was too big for any of the library’s walls. In spring 2008, funding was acquired to install the Grand Drape above the library’s balcony. This impressive curtain is hung using a traditional rigging system that allows the curtain to be raised or lowered as desired. 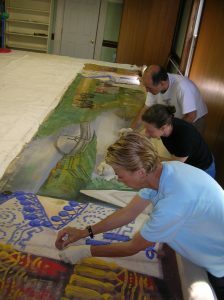 This project was initiated and made possible by the Vermont Museum and Gallery Alliance’s Painted Theater Curtains Project, directed by Christine Hadsel. Additional support was provided by the Huntington Conservation Fund, the Ben and Jerry’s Foundation, and many community members. As you admire these colorful painted curtains, you might imagine the entertaining dramas they once served as backdrops for. 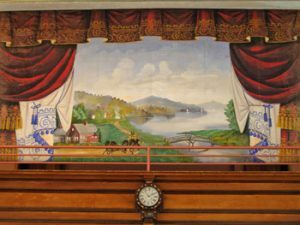 Someday we may return the drapes to a restored Town Hall—and perhaps even re-enact one of the plays that would have been performed by the Henry family for Huntington residents at the turn of the century.